If you’re lucky and live in Europe and have a lot of friends and family who have still not connected their Nintendo Wii to internet, you can now help them and earn Nintendo Wii points. The more you help, the more points you earn. Helping 10 persons gives you 5000 points, 20 person helped gives you 10 000 points and you can download every Virtual Console game for free. The Nintendp Connection Ambassador Promotion was launched in Europe on Wednesday, October 21st, 2009. 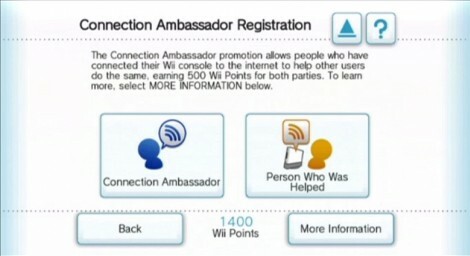 By becoming a Connection Ambassador, players can gain up to 10,000 Wii Points by encouraging friends and family to get connected to the Internet with their Wii. 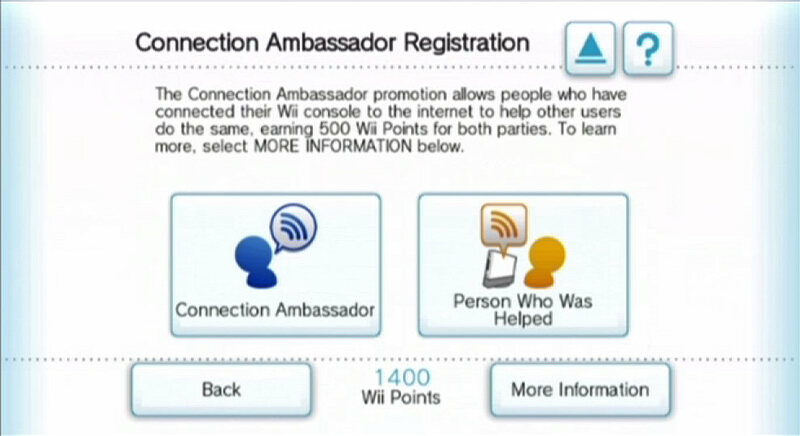 Each time a friend or family member connects for the first time to the Internet with the help of the Connection Ambassador, both the Connection Ambassador and the person they helped will receive 500 Wii Points. If you help 10 people connect to the Internet, you reach Gold status and can download ALL Nintendo-published NES games for free on Virtual Console as well as receiving a total of 5,000 Wii Points. 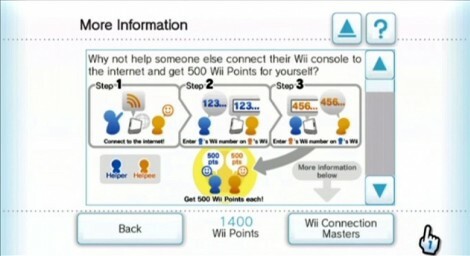 If you connect a maximum of 20 people to the Internet, not only will you attain Platinum status, you will also receive a total of 10,000 Wii Points to spend on WiiWare games and can download ALL NES, Super Nintendo and Nintendo 64 games on Virtual Console for FREE. How do I become a Connection Ambassador? 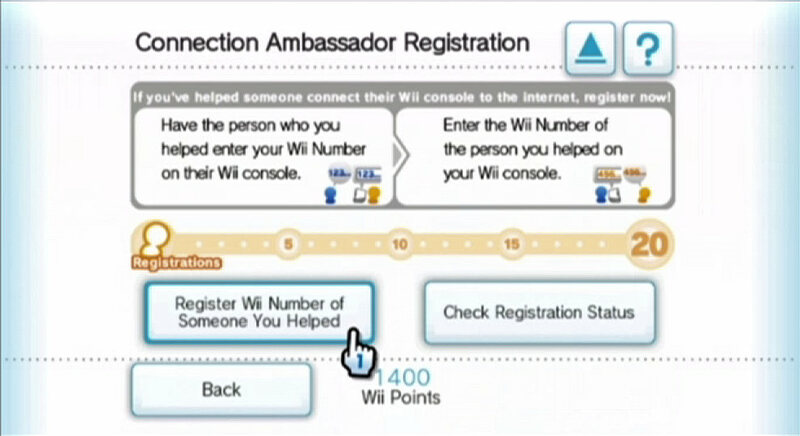 You will be prompted to enter the Wii Number of the person you have helped. What do I do if a Connection Ambassador helps me connect to the Wii Shop Channel? 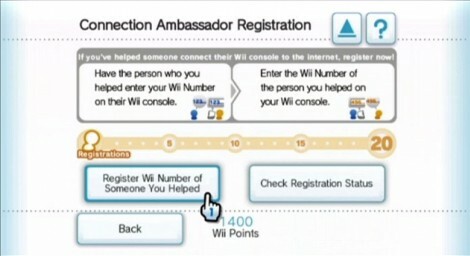 (Add after clicking Wii Shop Channel, then Connection Ambassador, then ‘Person Who Was Helped’) Then email me YOUR Wii number to daniel.wood3@gmail.com, I’ll enter it on my Wii then we’ll both get the free points! 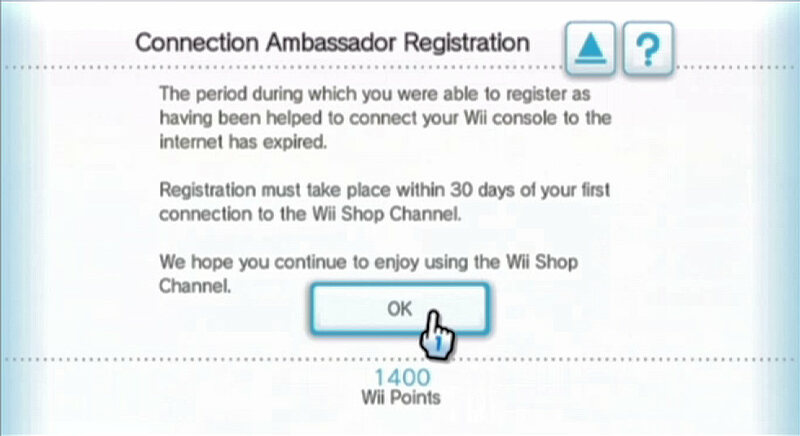 Please note, I have a UK Wii so you’ll need to be in the UK or change your country on the Wii to UK, and you have to have put your Wii online for the first time in the last 30 days – any later than that and it won’t work!